Toronto’s urban landscape runs along the northwestern shore of Lake Ontario. Punctuated by the soaring CN Tower, the skyline is best viewed on a boat shuttling between the city and the Toronto Islands. Hidden within that skyline are some remarkable architectural highlights, from the quaint bay-and-gable homes in historic Cabbagetown to the modern Royal Bank Plaza building and its windows covered with a very thin coating of 24-carat gold leaf, from the preserved Victorian-era industrial architecture in the Distillery District (the largest such collection in North America) to the controversial (and fatuous) addition to the Royal Ontario Museum. These are my favorites. Casa Loma, just a short subway ride from downtown Toronto, resembles a Scottish castle more than a Canadian house — a conglomeration of five-sided bay windows, stone turrets and towers, conical roofs, soaring battlements, and about a dozen chimneys. Part fortress, part castle, part home, the “House on the Hill” took Sir Henry Mill Pellatt, a prominent financier and industrialist, three years to build, from 1911 to 1914. He and his wheelchair-bound wife spent $3.5 million constructing, furnishing, and decorating their residence. Fewer than 10 years later, however, the house remained incomplete and the now-bankrupt Pellatts were forced to move out. The auction of everything they owned — including “the invalid’s wheelchair” — raised less than 10 percent of what they had spent. 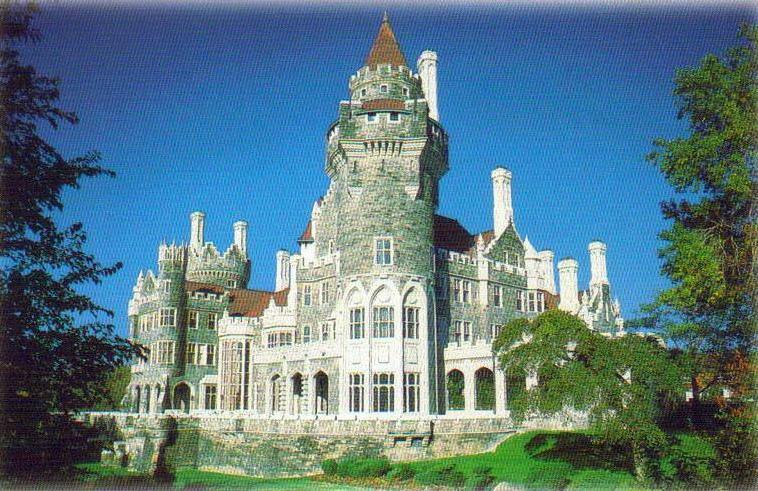 During the next decade, Casa Loma alternated between a hotel, nightspot, and abandoned pile. In 1937, it was reopened as a tourist attraction, and remains so today, enabling visitors like me to enjoy what had been the most elegant home in the city and the largest private residence in Canada, complete with the first elevator in the country (“Otis 1”) and more than 50 telephones, generating more calls per day than the rest of Toronto at the time. When I arrived, a symphony orchestra was rehearsing in the enormous great hall with its 60-foot-high timbered ceiling and organ pipes, providing an appropriate soothing soundtrack as I roamed around this whimsical fantasy house, searching for the secret passages between its 98 rooms. The grand ground-floor rooms, including the library, dining room, and Pellatt’s study, are outfitted with polished oak, mahogany, and walnut, while the huge conservatory, filled with light pouring in through large windows and a stained-glass dome, features both Italian and Ontario marble, and steam pipes that kept the flower beds warm during the winter. Spacious bedroom suites on the second floor the size of full apartments were made for more than just sleeping — I could imagine spending days there without the slightest inconvenience or want. The best spot to take in all of its 64,700 square feet is outside on the five acres of well-maintained estate gardens, including terraces and fountains. Had Pellatt’s land speculation turned out right — he bet that wealthy people would move to this area after he built his house, but World War I made that a losing wager — those neighbors would have had one remarkable site to gaze upon every day. Since it opened in Queen’s Park on April 4, 1893, after six years of construction, this striking provincial parliament building has been the meeting place of Ontario’s legislature. 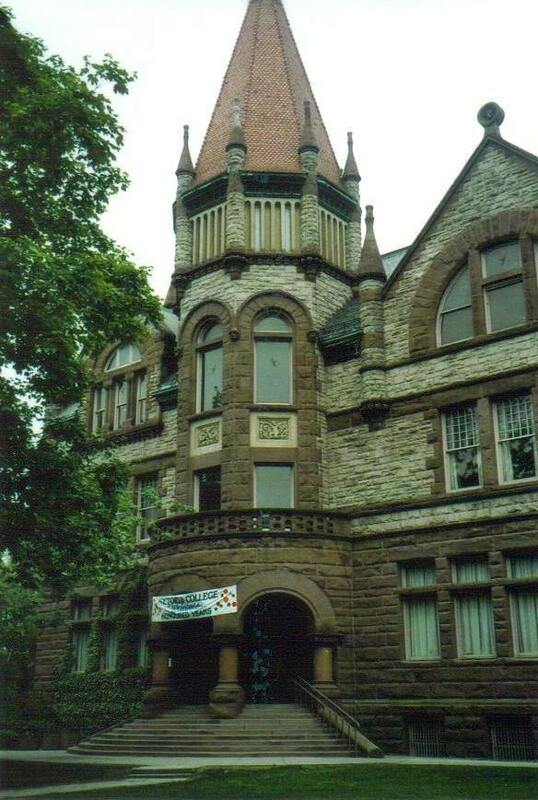 Constructed of rose-tinted sandstone and granite in the Richardsonian Romanesque style, the building features heavy stonework; rounded archways; domed towers; a porte-cochère; elaborate carvings of leaf patterns, grotesques, and the architect’s initials; and lancet, rose, bull’s eye, and dormer windows. Toward the top of the central block, an allegorical frieze measuring more than 65 feet long and about 20 feet high depicts figures and objects representing aspects of society and government. My accidentally private 30-minute tour of the Ontario Parliament Building — no one else had shown up on this particularly muggy summer day — began in the airy lobby. 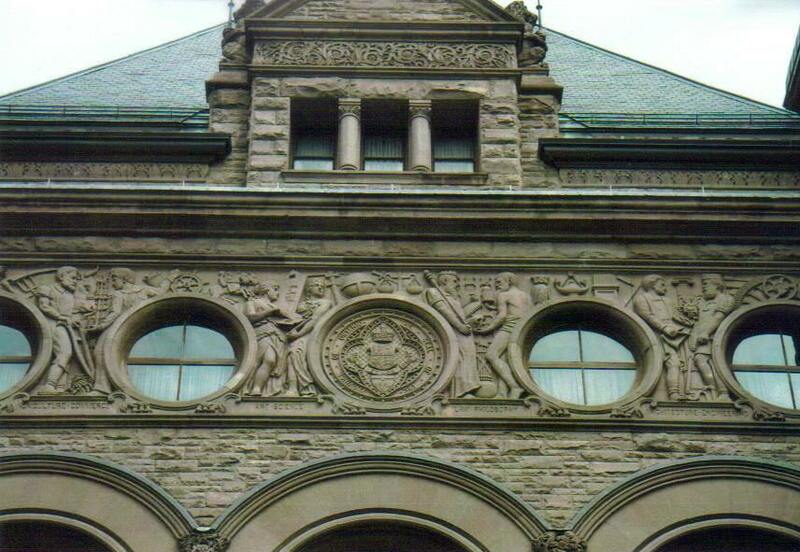 The guide led me up the grand slate staircase with mahogany railings and decorative ironwork to the Chamber Landing, lined with busts of key Ontario politicians. In the East Wing, light pours in from the colorful stained-glass laylight above. Cast iron columns support the ceiling and roof, the base of each column decorated with a dragon motif. The West Wing, redesigned after a fire in 1909, is dramatically different, with Italian marble balustrades and Corinthian columns and mosaic floor tiles. Along the way, I admired the original gasolier light fixtures, the oak floors and wainscoting, and the random Ontario-centric objects, like a block of nickel from Sudbury, impressed by the vocabulary of strength, purpose, and reliability employed in the building’s architecture that truly reflect the ideals of government. 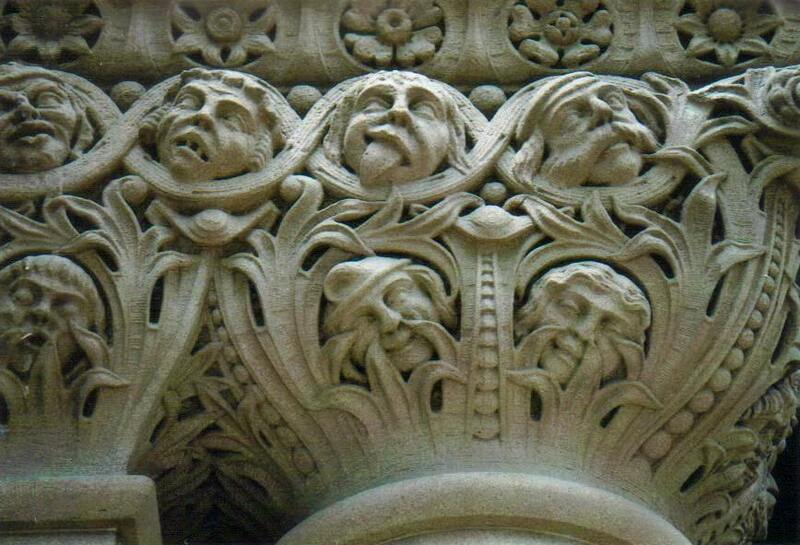 Like the Parliament Building, Toronto’s Old City Hall is a Richardsonian Romanesque masterpiece. Completed in 1899 as the largest civic building in North America, the façade of massive red sandstone blocks with darker brown horizontal bands presents tremendous curb appeal. At 340 feet high, the clock tower was the tallest structure in Toronto, with faces that measure 20 feet in diameter and enhanced by stone gargoyles that have since been replaced by bronze replicas for safety reasons. Countless miniature human faces representing councilors of the time are carved into the sandstone in the arches and column heads. Urban legend holds that they’re surrounded not by leaves but by the flames of hell — a deliberate dig by the architect, Edward James Lennox, who was brutally criticized by these politicians when the building started racking up cost overruns and construction delays. As punishment, they denied Lennox a plaque on the completed building acknowledging him as the architect. But Lennox got the last laugh: He had the stonemasons carve into the corbels beneath the upper-floor eaves around the entire building this sempiternal message: EJ LENNOX ARCHITECT AD 1898. The interior is fitted with marble columns, a grand staircase, mosaic inlaid tiles on the floor, and murals depicting Toronto’s pioneers. A stained-glass window titled “The Union of Commerce and Industry” definitely grabs attention: Topped by the city’s coat of arms, the window, at 16 feet wide by 23 feet high, is organized in three arches and features a dozen life-size figures amid scenes of Toronto’s busy waterfront. When I exited the building, I took a seat at the reflecting pool, comparing and contrasting this extraordinary building with the New City Hall across the street — a cold, modern atrocity that looks like it belongs in, say, São Paulo. Clearly, there’s no comparison. Founded as the Upper Canada Academy in 1836, Victoria College emerged as an independent college in 1841 and remained so until 1884, when it merged with Albert University to form Victoria University, which, in turn, was absorbed into the University of Toronto as one of its colleges. Old Vic, the college’s oldest building, was constructed in 1892 and bears striking similarities to the Old City Hall, on a less massive scale, with its use of sandstone and stronger brown accents in the Richardsonian Romanesque style. The asymmetrical edifice features a rusticated stone face on the first story. A broad arch at the entrance, next to the base of the central tower, with a large stone daisy on either side, and a three-arched entrance at the base of the side tower both welcome students, faculty, and visitors in a grand manner. Both octagonal towers sport red-tile roofs. Lots of slender turrets protruding from the walls lend a baronial air to it. Going to class here must have been, and I’m sure still is, an inspiration. 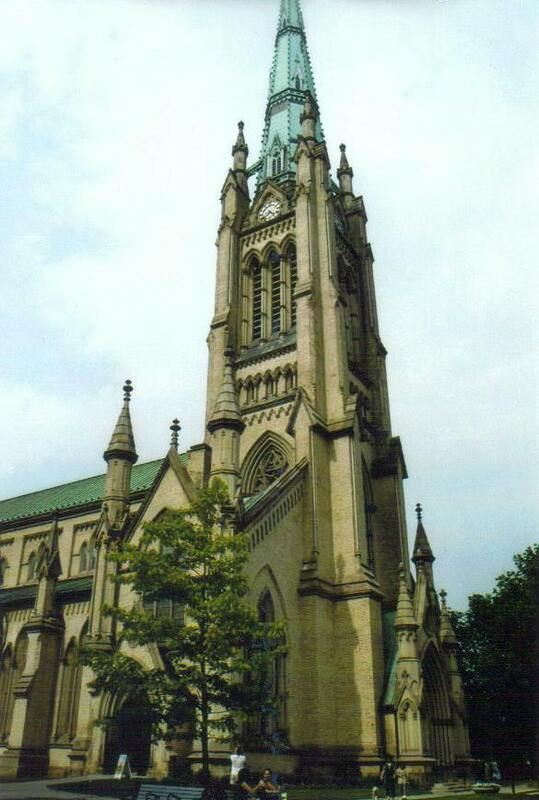 The current Cathedral Church of St. James — the fourth building on the site — opened in 1853 after a devastating fire took out the third church, as well as much of Toronto’s Old Town. It wasn’t until the mid-1870s, however, that work was complete, work that included Canada’s tallest church tower, at 305 feet high. The 10 carillon-style bells that were added still ring every 15 minutes, as well as for services and weddings, and the clock donated by the citizens of Toronto still runs. As I admired the white brick and Ohio sandstone exterior of this Gothic Revival church, the sound of music emanating from within caught my attention. I stepped inside and walked halfway down the 200-foot-long church to take a seat in a pew to listen to a practice session of a rather talented boys’ choir. I noticed the memorials along the walls, some of which date back to parishioners who fought in the American Revolutionary War, as well as the stained-glass windows from Germany, England, Canada, and the United States. When the choir wrapped up for the day, I took a closer look at the German-made stained-glass window at the chancel called “The Works of Mercy” window, which illustrates, in six separate panels, those works: tending the sick, sheltering the homeless, feeding the hungry, visiting the imprisoned, clothing the naked, and giving drink to the thirsty. The window was a direct reminder to the financially secure members of the church to be responsible for those who were less fortunate than they and of what was expected of them as good Christians.